Downloaded. Installed. And gained access to the root prompt. All in 5 minutes. I really should do something about the perl decryption though. And to the ones mailing me about my BlueOS root access backdoor. Well, I will not inform how I do it, because then it will be closed in matter of minutes with a new maintenance release from Bluesound :-). That said, injecting a new password hash into the recovery iso, while not for scriptkiddies, are not that much trouble and should take an educated fellow less than a couple of hours work. A year ago I wrote a small perl Mechanize script to send sms from the command line (very useful for scripts) utilizing the web-sms service you get as a Bibob customer. Now a year later I actually found some use for it, but it didn’t work anymore due to the fact that Bibob had changed their website since then. And not just the graphics and layout, but the whole shebang. I have made some very small changes to the perl script to make it work again and I appriciate the versatility of perl and that the Bibob webmasters obviously thought a great deal about the upgrade. The nature surrounding the castle is simply astonishing. Almost no man made sound can be heard and it is very easy to take a tour into one of the forrests around the castle without hearing or meeting anybody but yourself and your spouse. The food served at the castle is of gourmet class. It is not your average continental steak or ala carte menu. You get a 4-dish gourmet menu with 2-3 appetizers in between. It is complemented with a 4 glass wine menu that enhances the experience believe it or not. 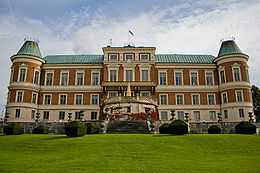 I had a splendid weekend there. Real quality time with my beautiful wife. Will not be the last time we visit that place! It can be handy to send sms’es from scripts. 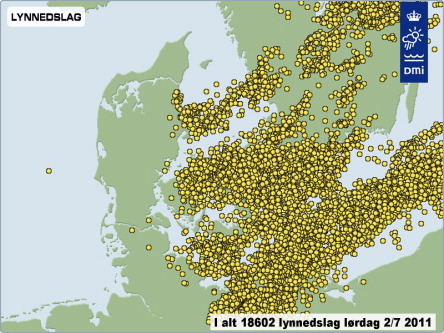 In old time you could do that in Telia by sending a mail to <mobile number>@gsm1800.telia.dk. But that service was closed. Now that I am leaving Telia in favor of Bibob I saw that they had a websms service. Do not forget the agreement between you and bibob. You are only allowed to use the websms service (and thus this script) for personal use. I am not to blame if bibob closes your bibob account because you spam-smsed a lot of people. # License:Â Â Â Â Â BeerWare – Thomas S. Iversen wrote this file. #Â Â Â Â Â Â Â Â Â Â Â Â Â Â do whatever you want with this stuff. Last night a big thunderstorm hit my home. During the storm a lightning actually hit the house/so close to the house that it went into the electrical system. 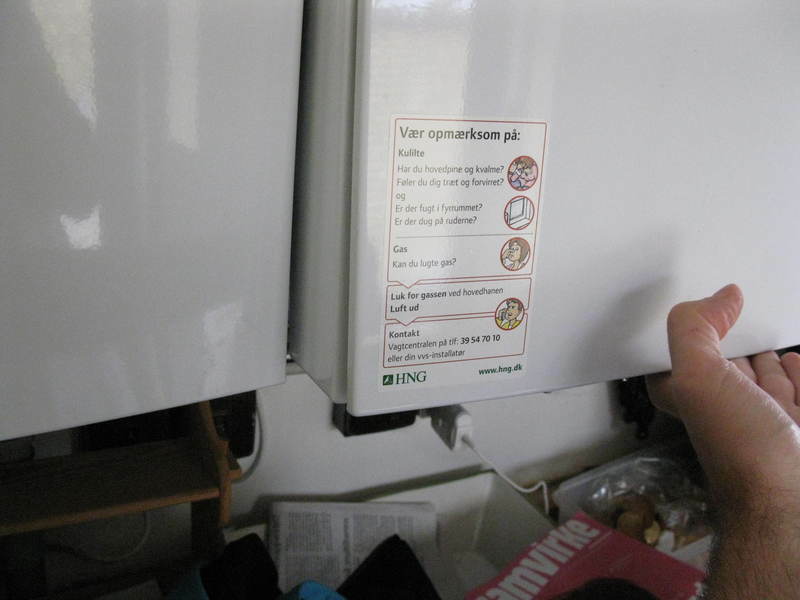 Luckily the legislation about electricity in danish households requires that electricians installs HPFI and thermo fuses, so after the a white spark out of a wall plug, the HPFI and thermo fuses kicked in and took down the whole system. …. or so I thought. 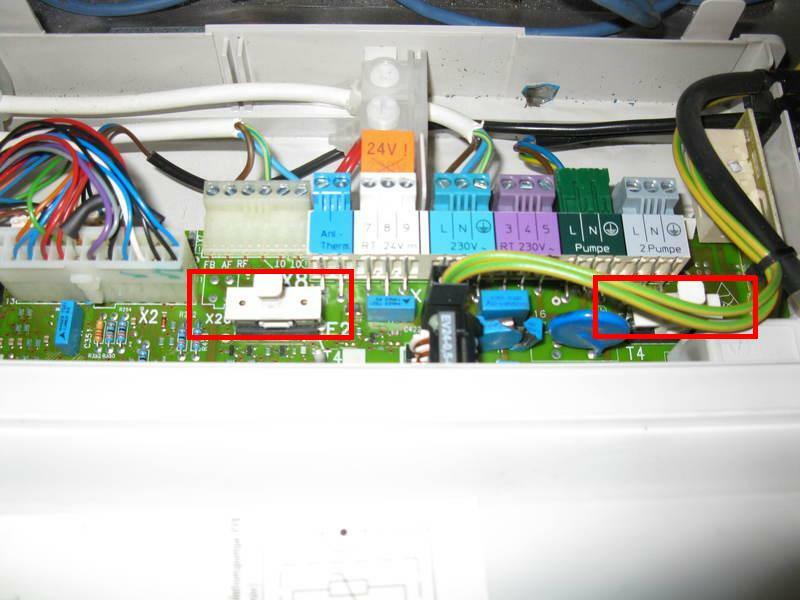 The lightning had actually been fast enough to hit the control unit of my Gas Boiler – It would not turn on this morning to heat water for the day. 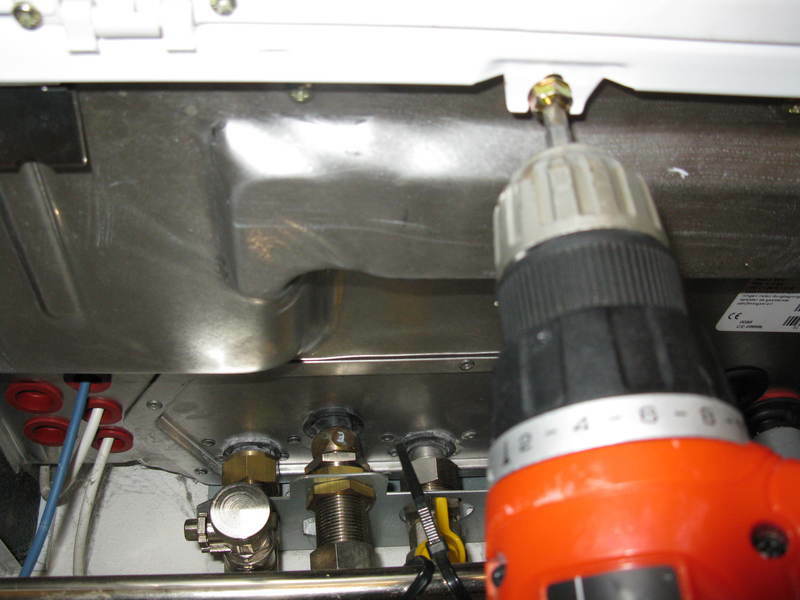 This post will show how to open a vaillant ecotec gasboiler and exchange the fuse(s). 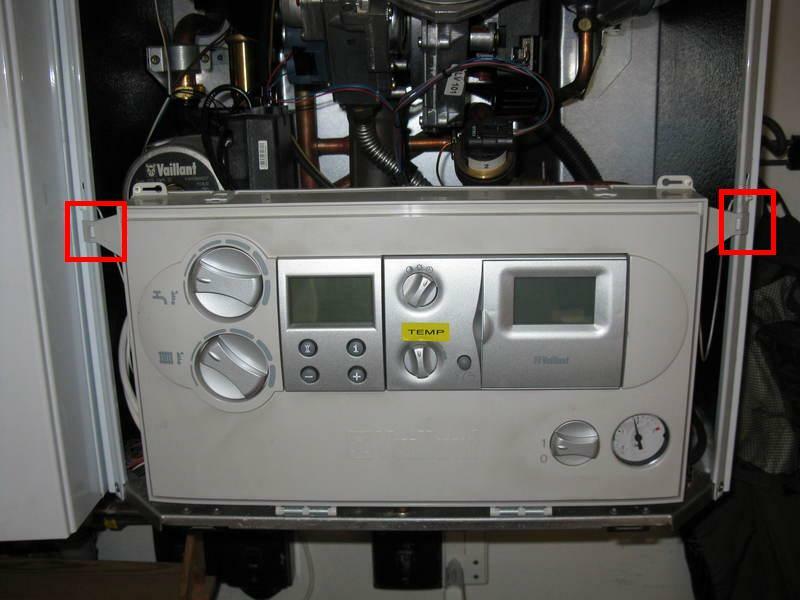 Turn off your boiler before doing anything. Disconnect it from the wall plug. Use original fuses. If in doubt – STOP! 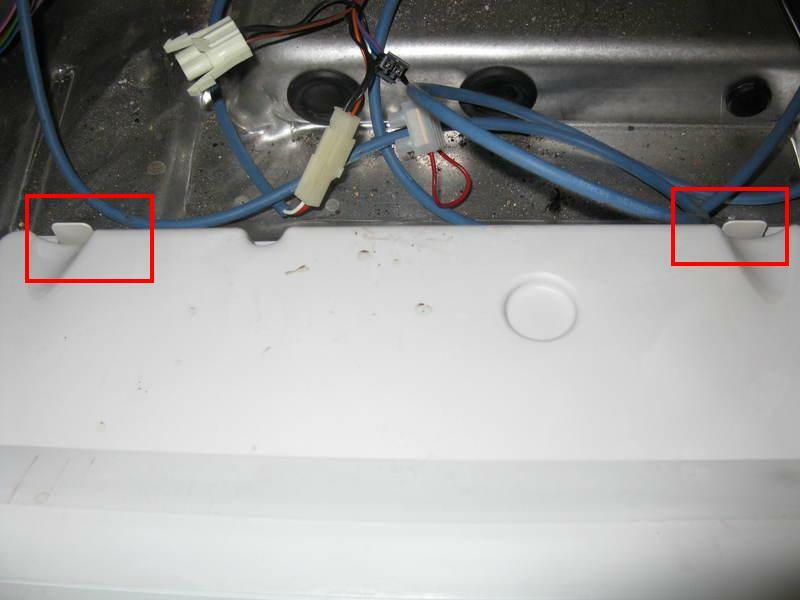 Do not tamper with the Gas part of the heater! If the fuse blows again, do NOT substitute with something that can not blow! Do call an qualified repair man if that happens! And finally: if you blow up yourself and/or your house/friends/families/dogs/whatever I can not be held responsible! Do not trust a stranger on the internet just because you are trying to save a few bucks! With the disclaimer out of the way, lets get going. 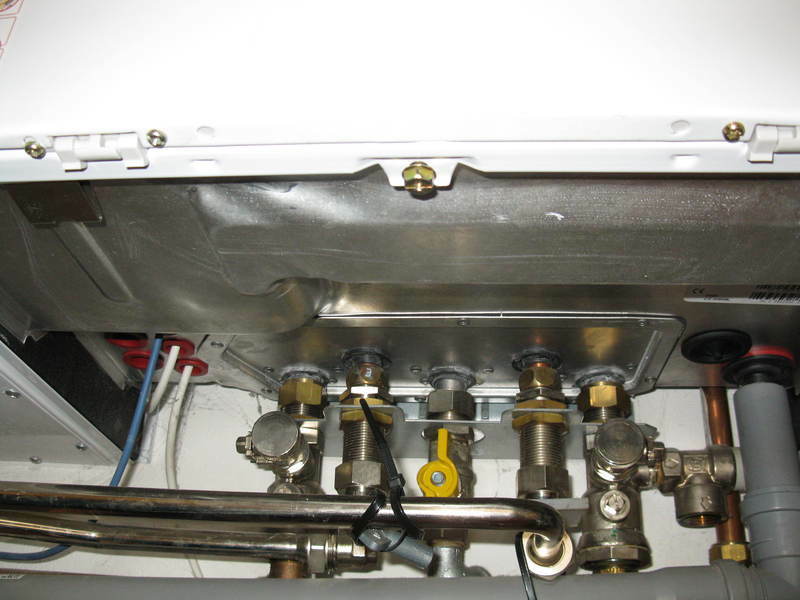 First locate the front of your boiler. It will look like this. You should now be able to look inside the boiler. If you are unsecure, stop. Remember the disclaimer! Now we are going to open up the control unit. 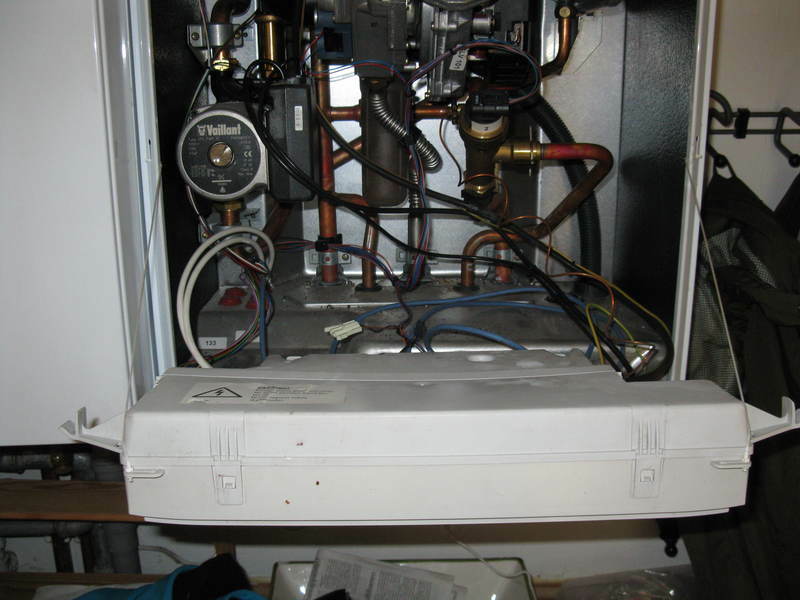 Assemble the whole lot back and turn on the boiler again. Hopefully it will come back to life. 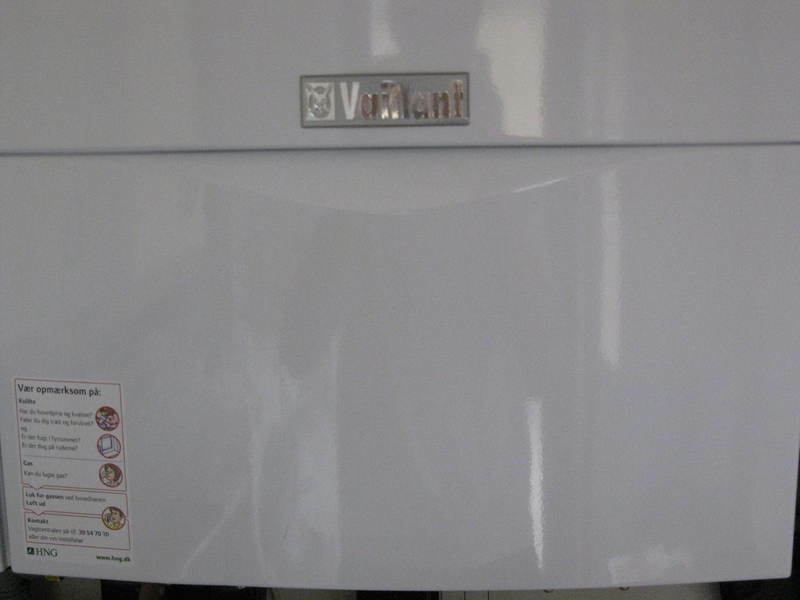 If it doesn’t something is seriously wrong – call an vaillant approved repair man. And …. do not forget to order a new fuse right away! Here is the business case: both /dev/sda2 and /dev/sdb2 was not fully utilized. /dev/sdb2 had 67GB unused and /dev/sda2 had around 250GB unused. That meant that I could resize / with 67GB up front, for free! So how do you do this, in an easy, controlled way, without taking time consuming backups of hundres of GB (I do make backups, so it is very easy for me to write this )? You can do it like I did below. # Then we delete and recreate /dev/sdb2 with a larger size. When the server came back up, I assembled the /dev/md1 device again and waited for a resync. I speeded up the resync quite significantly by issuing the echo commands, which basically just tell md that it has to work as hard as it possibly can. When the resync was done, I did it all over, replacing /dev/sdb2 with /dev/sda2.Â After that,Â I had grown the underlying partitions on my two drives, but both md and lvm had not noticed anything. 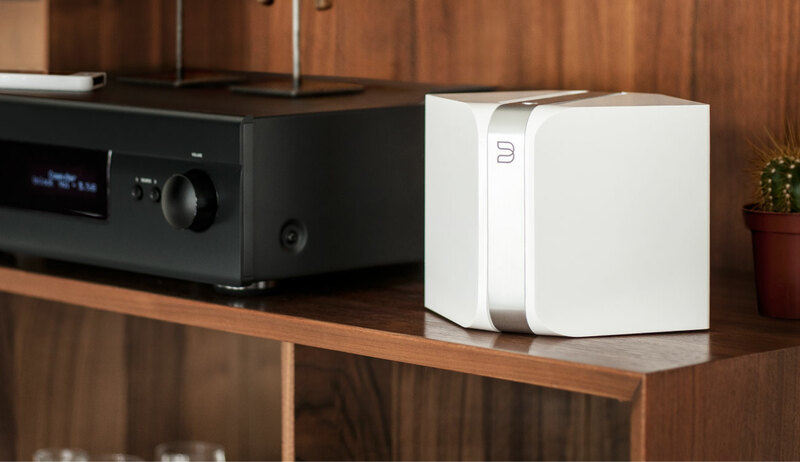 I made sure everything worked fineÂ and went onto theÂ next step – growing an md device on the fly. # Recheck the device stat. Performing an on-line resize of /dev/vg000/root to 78089216 (4k) blocks. The filesystem on /dev/vg000/root is now 78089216 blocks long. Run a terminal client on the serial console device. Configure the serial port to either the failsafe 9600 n-8-1, Hardware Flow Control=NONE, or to the much speedier 115200 n-8-1, Hardware Flow Control=NONE. The latter should be used only if the serial port in both ends support this kind of speed. Installation willl continue, ouputting the dialogs on the serial device. You should ofcourse replace ttyS0 with another serial device, if applicable. I am at a loss as to why I have to do this in order for me to install Ubuntu Server 10.04 over the serial port in 2010! 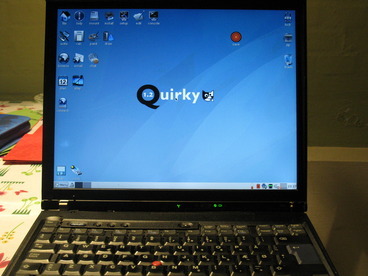 How to use a broken IBM Thinkpad T43 for something useful using puppy linux. I recently got my hands on a IBM Thinkpad T43. Unfortunately it was broken. 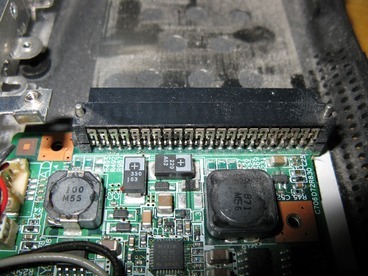 More specifically the connector between the mainboard and the harddrive had problems. So then what? Throw out the laptop? Or? … I decided to make a project out of it. A laptop without storage is useless. 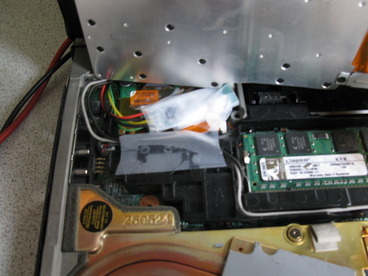 Due to the broken connector, I could not use a harddrive. I did not want to use a cdrom as it is a slow medium. That left me with a USB flash drive as the only option. 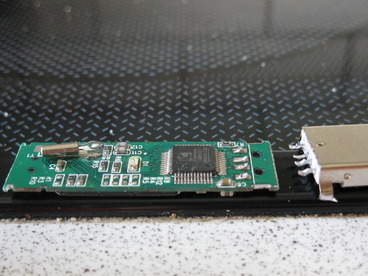 It would be a clumsy solution just to plug a USB flash drive into the laptop and be done with it, so I chose to solder a USB flash directly onto the mainboard. 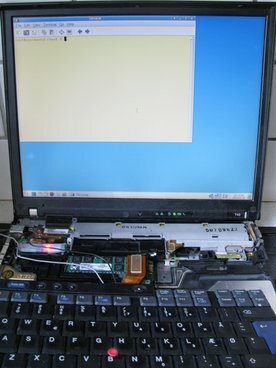 After that I soldered 5 wires onto the PCB of the laptop and used one of the holes in the PCB used for assembly as a pass through hole. I initially used 4 wires as the USB connector only had 4 pins, but that was not enough. More on that later. 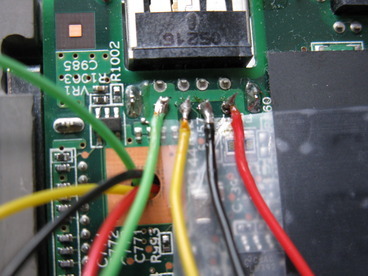 Before powering on anything, I used a multimeter to check for bad solderjoins and shorts. I found neither. Luckily I had a Linux based rescue distribution installed on the USB flash drive, so I just booted that to see if the operation on the T43 was a success. As can be seen below it worked just fine. Well, sort of fine, but more on that in a moment. Almost done now. 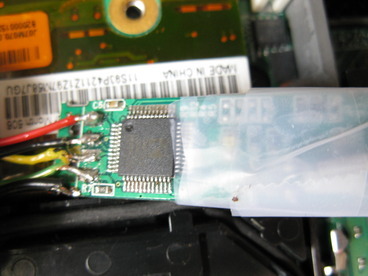 I just needed to assemble the laptop again, leaving the USB Flash inside. That cryptic message just states that the USB device is drawing more power than it is allowed to by the USB specification. Or more precisely that the port on the USB hub inside the laptop is delivering more power than it was supposed to. It first that puzzled me. Then I read about the USB connector and realized my fail. The 4 wires of the USB connector consists ofÂ VCC, GND, Data+ and Data –. Given both VCC and GND was part of the 4 pins I only soldered 4 pins. 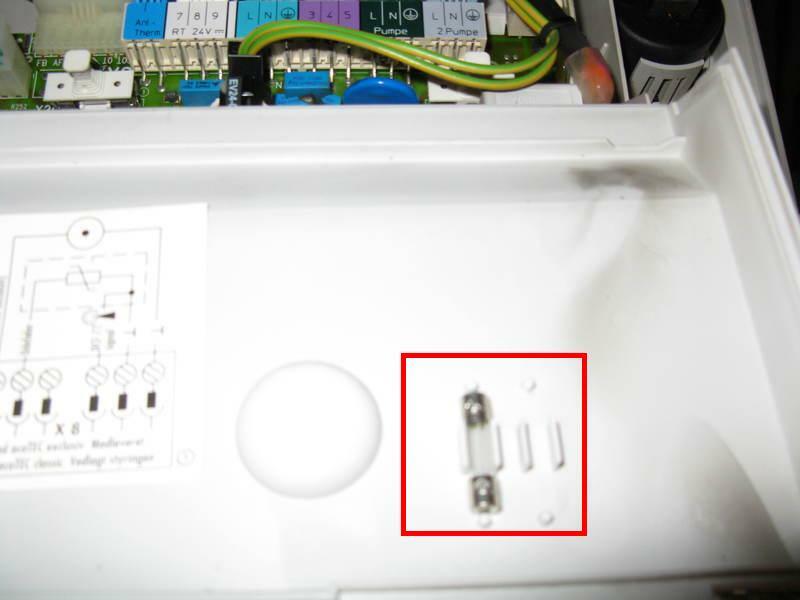 After seeing the problems above, I investigated the matter and found a reference to OverCurrent (OC) protection on the header itself. 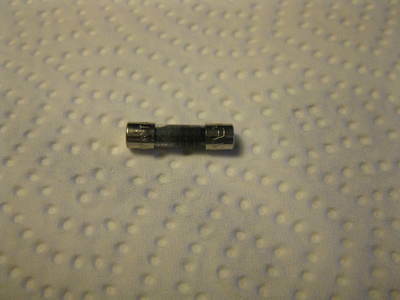 I thus soldered the 5th pin and the problem went away. 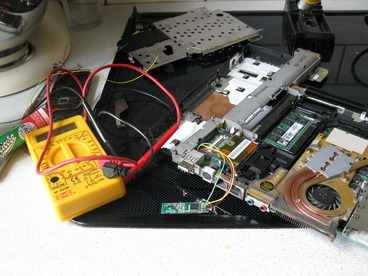 I now had a working IBM Thinkpad T43 with 1GB of flash storage. What should I use it for? I decided to use it for puppy linux. Primarily for two reasons. I downloaded the 106MB large iso file and burned it onto a CDrom. Now I faced the problem of installing puppy linux onto my flash without using a cdrom drive (as I found the laptop without one). Puppy linux made it quite easy. Using another computer I booted the cdrom. Installed puppy onto a spare flash drive. Booted that flash drive in my IBM Thinkpad T43 and pressed “install” once more, installing it onto the “internal” flash drive.